This chocolate cupcake recipe is very close to my heart, which I almost baked it for more than 10 times in last few months. May be because of fail-safe recipe since it comes out perfect every time I bake. These are quick and easy to whip up when your friends ring to say they're popping over. It travels well and also works fantastic when you throw kids party. My absolute favorite best part of this recipe is to mix all the ingredients in one bowl and enjoy baking. Love a one bowl treat! 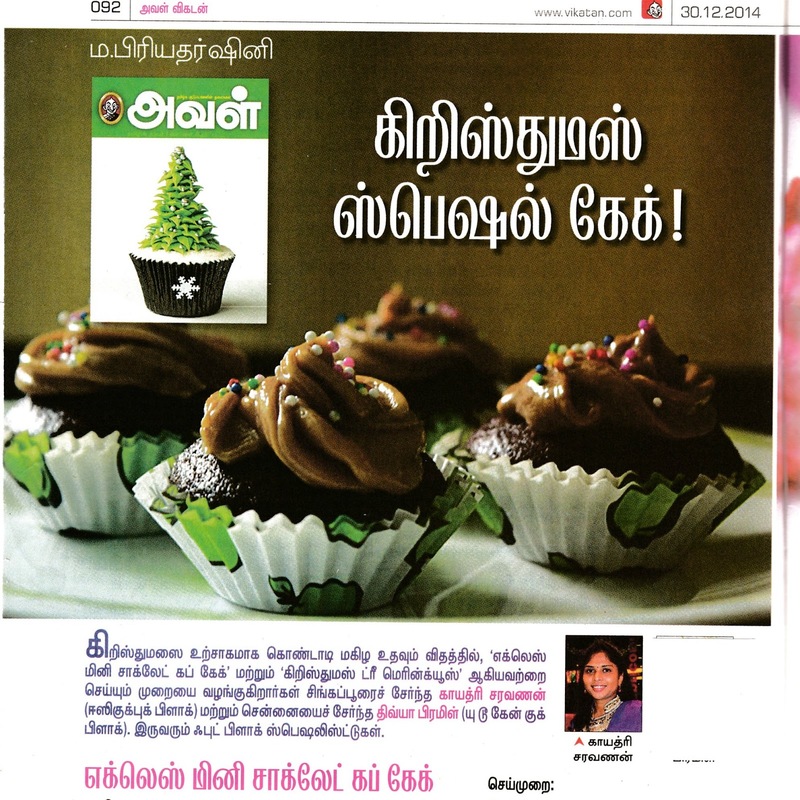 Between, Happy to share with you all this recipe has got featured in Popular Tamil Magazine"Aval Vikatan" dec 30th, 2014 edition for Christmas special. I sincerely thank Vikatan group and magazine members for giving me such a recognition. 2.Line mini cupcake pan with paper liners. Set aside. 3.In a medium mixing bowl, whisk together the dry ingredients (flour, sugar, soda, salt and cocoa). 4.In another mixing bowl, whisk together the wet ingredients (oil, water, vanilla and vinegar). 5.Add dry ingredients to wet ingredients and whisk together until smooth. 6.Fill cupcake liners about 2/3 full. 7.Bake cupcakes for 16 to 18 minutes or until the toothpick inserted in the center of each cupcake comes out clean. 8.Cool in pan for 2 minutes. Transfer onto a cooling rack to cool completely before frosting. 9.For Buttercream Frosting, whisk the butter with icing sugar until smooth and creamy. Add vanilla, cocoa and cream, continue to beat till it reaches spreading consistency. 10.Spoon the buttercream into the piping bag with star nozzle and pipe the frosting onto the cupcakes using spiral motion in a large swirl. 11. Decorate with cake sprinkles. Enjoy!! Stick on to the measurement to get perfect cupcakes. Plain Vinegar can be used if there is no apple cider vinegar. Include chocolate chip or any nuts to improve taste. Reduce sugar portion and add few walnuts, to bake a perfect chocolate brownie. The amazing finger millet is a nutritional cereal. Including in regular diet keeps us fit and fine.The millet is extremely rich in calcium, protein and iron, therefore suitable for all age groups. The millet is used to prepare idli, dosa, porridge, sweet and also savory snacks. Ragi also known as Kezhvaragu are used to prepare kali in TN side, very old and authentic recipe loaded with lots of goodness. Coming to today's post, this recipe make use of ragi or finger millet flour resulting crispy and tasty dosa.This makes a healthy start of the day. If you get whole ragi, use it. I did not use rice instead used little amount of rice flakes to give softness to dosa. Serve with coconut chutney. 1. Place urad dal and fenugreek in a medium size bowl, wash in several changes of water until water runs clear. Add enough water and soak for 4 hours. Drain and discard all the soaked water. Grind to smooth and fluffy batter by adding water in between as needed. Transfer to a bowl. 2. Similarly wash poha thoroughly in water, soak in sufficient water for 30 minutes and grind to smooth and fluffy batter by adding water as needed. Keep aside. 4. Cover the vessel with lid. Keep in a warm place to ferment for 8-10 hours or overnight. 5.The fermented batter should smell slightly sour and doubles from its original volume. Ladle the batter slightly and it should be frothy and pouring consistency, so add water as needed. 6. Heat the dosa tawa or griddle, grease lightly with oil, pour a ladle of batter and spread evenly to make thin dosa. Drizzle some oil and cook until top layer sets completely whereas bottom turns light golden brown. 7. Flip and cook the other side for a minute. Serve hot ragi dosa with coconut chutney. Adding some quantity of poha gives soft and fluffy dosa. In order to make crispy dosa, don't flip instead cover with lid to cook evenly. Fold the dosa and serve immediately. Updated Note: Came across with many queries regarding the taste and color of ragi dosa...1) it tastes excellent like normal only the color may look weird. 1) if you are trying ragi dosa for the very first time use one portion of ragi + one portion of idli rice . It taste equally good. Including Broccoli in diet at a regular base is good for health. It is also referred as "Health-Boosting" vegetable. Here is a quick way to add as a favorite recipe in your list of collection. Those who are cooking / using it for the first time, can always try with inclusion of another vegetable. I used potatoes along with it to make a handy subzi for lunch to go with roti and rice. You can use paneer or tofu along with to make a complete meal. Broccoli should not be blanched or boiled in water rather steam cook / saute in pan directly and use to get its full benefits. Divide the broccoli into small florets. wash thorughly and dry it. Boil 2 potatoes with 2 pinches of salt, peel and cut into small cubes. Keep aside. Heat a tbsp oil in a fry pan on medium heat. Add cumin Seeds and allow them to sizzle. Add asafoetida, garlic and green Chilies. Stir for 15 seconds. Add broccoli and mix well. Cover and cook for 2-3 minutes. Lightly salt the broccoli and continue to cook covered for another 2-3 minutes. In a small bowl, combine besan, turmeric powder, cumin powder, garam masala, coriander powder, red chili powder and salt. Uncover the broccoli, add cubed potatoes and saute well. Sprinkle the besan mixture evenly over all of the vegetables. Uncover the broccoli and sprinkle a little water. Just to make little moisten. Mix, cover and cook for another 3 minutes. Squeeze Lemon Juice and serve hot with chapati or rice and daal. You can either steam cook broccoli for 5-8minutes in steamer, it reduces cooking time. To make the subzi more crispy, fry for few more minutes before serving. Sprinkle some Kasthuri methi at the end to increase the taste.